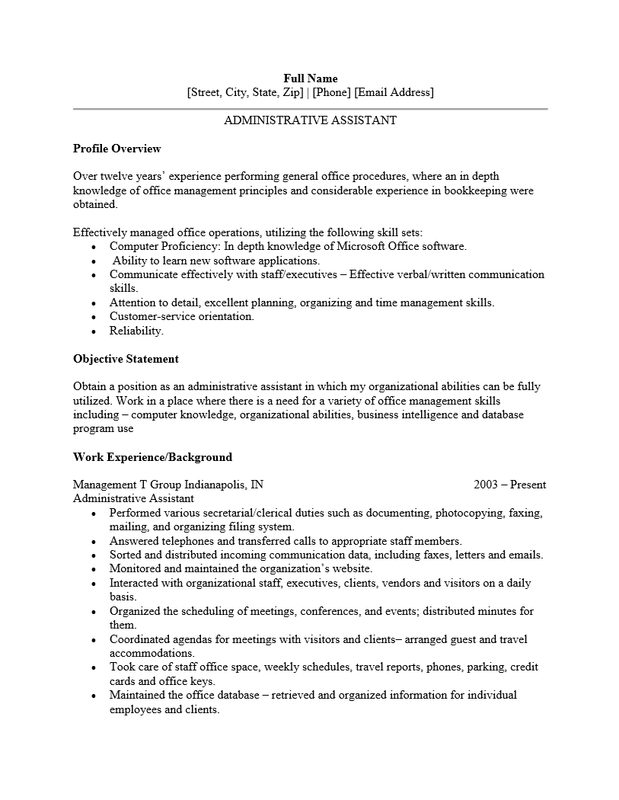 The Senior Administrative Assistant Resume Template is composed of the proven sections that should frame a resume. Each of these sections are meant to divulge information about a candidate. Several are designed to act as supports for others. The important thing to keep in mind when constructing a resume is that it is the primary means of a first impression an applicant makes on an employer. Naturally, a resume is accompanied by additional paperwork such as a cover letter in most cases however, your resume will be your at-a-glance first impression. Many recruiters are faced with a truly staggering number of applicants at times and it will be the at-a-glance impression you make that may be the deciding factor on when or if they carefully review your inquiry. Therefore, it is quite important that your document gets to that desk relatively quickly and sparkles when it does. That is, it should arrive within a day or two of finding an opportunity and must look professional and easy to read. A Senior Administrative Assistant Resume Template will allow for quick revisions, so that each one has content geared towards a potential employer’s needs, and reduce the margin of errors many recruiters see on some very professional resumes. Step 2. Under “Profile Overview” write a short synopsis of your accomplishments or professional experience. This can be several sentences or just one or two with a list. Step 3. In the “Objective” section, compose two to four statements where you clearly but briefly state why you are sending this potential employer your resume and how you envision yourself functioning in this position. Step 4. The “Work Experience” section, you must enter your professional history. Each previous employer will have their own entry. Begin this entry with the name of the company you worked in, the city and state of that location, and the dates you were employed there for. The second line should have your job title there. The following lines should be a list of your accomplishments and duties performed while there. Step 5. The “Achievements” section is a powerful section to close a Senior Administrative Assistant Resume with. Here, list any awards, accomplishments not mentioned, or notoriety you have.